What makes Orijen dog and cat foods so special? Wholeprey Diet – All Orijen dog foods focus on a wholeprey diet, which means that your pet will be receiving meat, organs, and cartilage from the animals/fish that are used in each variety. These three components of an animal help ensure that your pet is nourished the way tat mimic Mother Nature and deliver nutrients that virtually eliminate the need for synthetic ingredients. Grain Free – Look at the front of any bag of Orijen dog or cat food and you will see the ratio of meat to fruits/vegetables to grains. Every bag has 0% grains and potatoes, which don’t provide much of anything in terms of nourishment and are not what dogs are biologically made to eat. Each Orijen dog and cat food is made of high percentages of meat and fish and the rest from fruits and vegetables. 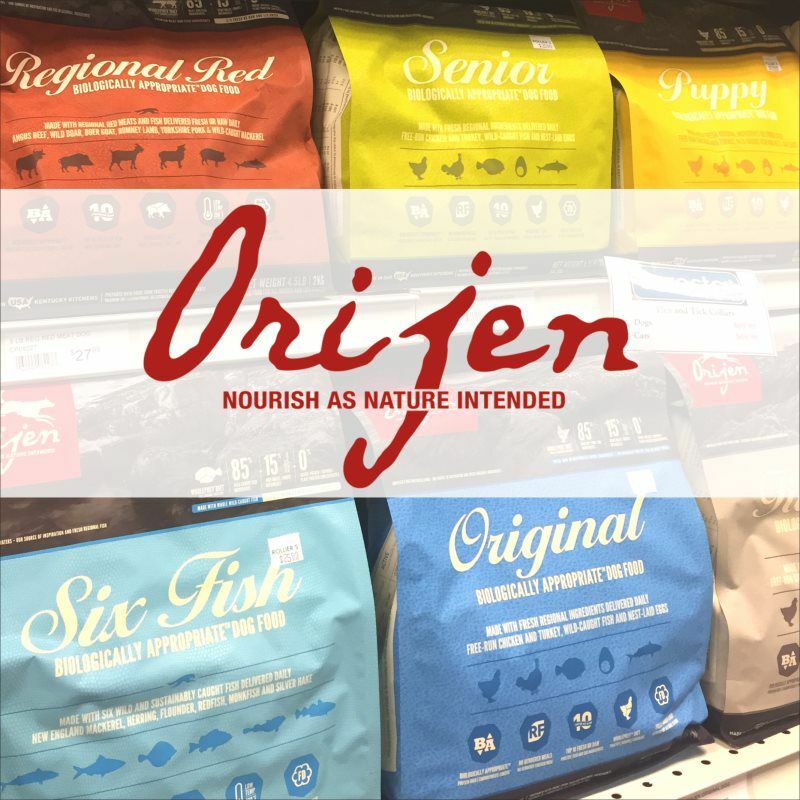 Fresh, Local Ingredients – All of the ingredients used in Orijen dog and cat foods are brought in fresh daily from local suppliers that they know and trust. This commitment to only the freshest regional ingredients ensure that every bite of Orijen pet food is both safe and tasty! For more information on Orijen pet foods and their fresh, local ingredients that are used, please view the video to the left. Fromm pet food is our best selling pet food and for good reason! Their dog and cat foods are made with the utmost attention to detail in both the recipe and the with the supply chain. The result is a pet food that is safe, responsibly sourced, nutritious and very delicious for your dog or cat. Stringent Testing – Every ingredient comes from their Approved Supplier Program. When the ingredients arrive at the Fromm manufacturing facility, each ingredient is tested to be sure that it meets their standards before it is unloaded and used in the formulas. Once the recipes have been completed, the testing is not complete. Each batch is tested so as to confirm that it meets the guaranteed analysis printed on the bags and to be sure that it contains no pathogenic bacteria. Not until these tests are performed can a batch be sent to stores for sale. Homemade – All Fromm pet food and treats are made in their two manufacturing facilities in Wisconsin. This allows for full control over the quality and safety of every product. No part of the manufacturing process is outsourced, so you know that the Fromm Family is able to keep a watchful eye on what goes into their product and how it is made. Fromm is a fifth-generation family-owned and operated business. They have been innovators from the start, making the first ever all-granular pet food by cooking meat and grain together way back in 1940. In 1949, Fromm sold the first packaged granular pet food after years and years of testing. Today, the formulas have grown more nutritious and more diverse than ever before. In our store, we stock both the Fromm Gold and the Fromm 4-star nutritionals for both dogs and cats, as well as a large selection of wet canned pet food and holistic pet treats. If you are interested in trying one of the many Fromm formulas, please ask for a sample. Fromm is a big supporter of pet food samples and most every dry dog and cat food is available in a small sample pack for you to try! 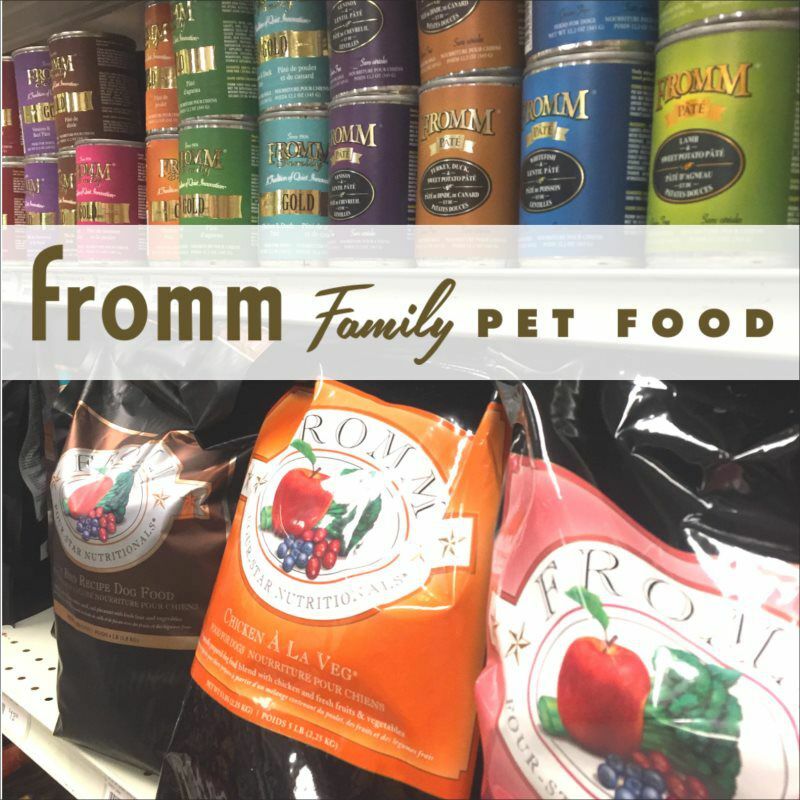 If your pet is hooked on Fromm pet food, be sure to ask for the frequent buyer program details the next time you are in our store. For every 12 bags of pet food you purchase, get the 13th bag for free. 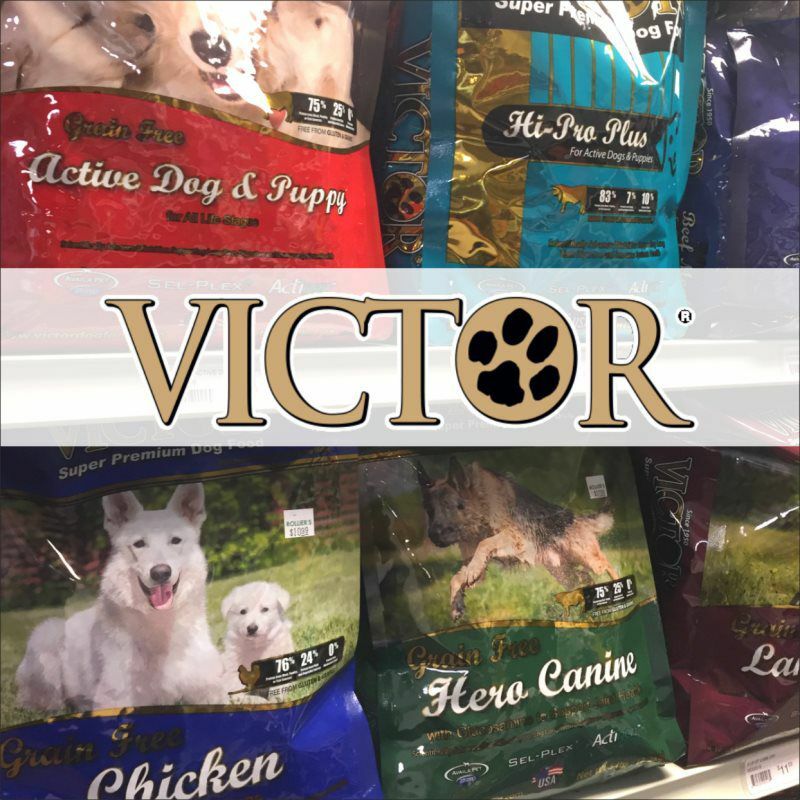 Victor pet foods are made in Texas with a huge emphasize on nutrition. Each Victor dog food variety is designed to provide complete and balanced nutrition to your loved one. Simply choose based on what your dog likes. If you aren’t sure what he or she might like, then be sure to ask for a pet food sample and try before you buy! What else makes Victor dog foods unique? Locally sourced ingredients including most ingredients that come from mid-America. In fact, their chicken comes from a farm just 7 miles down the road from their manufacturing plant in Texas! Thoroughly tested and screened for quality. Every ingredient that is used in Victor pet food is tested upon arrival at their manufacturing plant, ensuring each Victor variety is the safest it can be. Easy-to-Digest recipes are a focus for all Victor dog food recipes. They are free from corn, wheat, soy, gluten, or any other processed grain by-products. It’s pure, easy to digest ingredients, through and through. 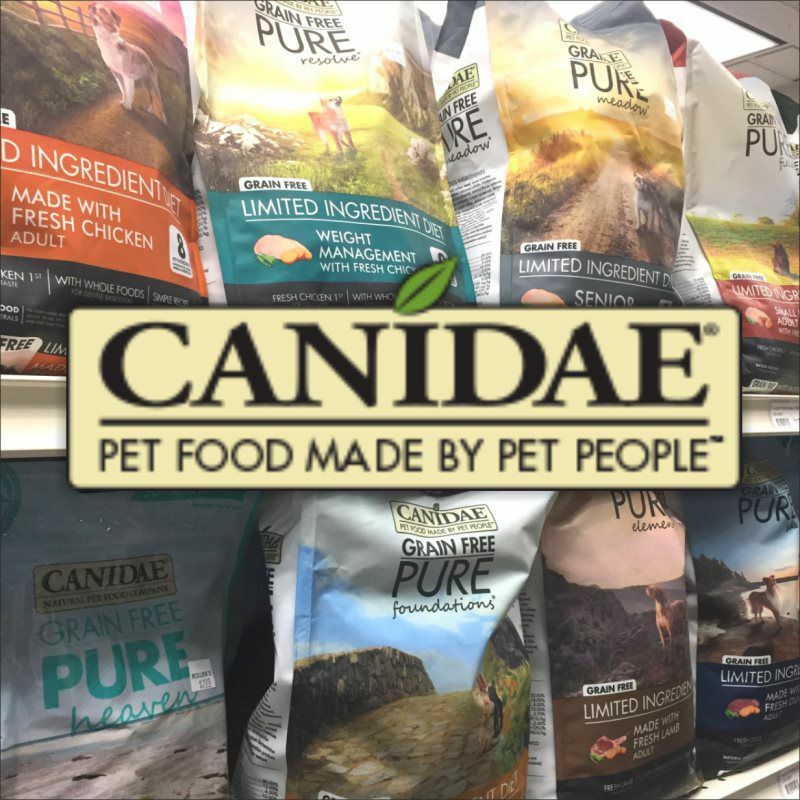 We are excited to offer high quality pet foods from the family-owned Canidae company. It’s pet food made by pet people! Grain-Free Pure dog food, which is their limited ingredient diets made from just 7-10 key ingredients. It’s pure flavors that your dog will love whether they have food sensitivities or not. Available in puppy and adult varieties. Grain-Free Pure Petite dog foods are limited ingredient diets with only 5 key ingredients and made in small batches…perfect for your petite furry friend! Raw Coated dog food formulas, which are traditional kibble foods with a freeze-dried coating of the same protein. The goal here is that these formulas aren't just highly nutrious, but they are also irresistable to your dog. Available in Salmon Puppy, Small Breed Lamb, Avian, Chicken, Fish, and Red Meat formulas. Many flavor options are available so there is lots to choose from. For more information on how Canidae recipes are made and how the independent company started, please view the video to the left. BOGO - Buy any 1 Bag, Get a 2nd Bag for FREE! See Store for Complete Details. Sale prices and in-store coupons expire on March 31st, 2019. Nutrition to the nth degree: Open farm is committed to quality in every recipe. They source from family farmers that are committed to exceptional quality and sustainable farming practices. Each recipe focuses on premium proteins and eliminate all low quality ingredients, such as corn, wheat, soy, and rice. All fruits and vegetables used are non-GMO, include generous proportions of coconut and fish oils, and contain prebiotic fibers to help support healthy digestion. Highly Transparent: Each recipe clearly marks where the food came from and what is inside. Most ingredients are locally-sourced and all suppliers must pass regular testing and mandates to continue providing ingredients for Open Farm. They are committed to ethnically, sustainable sourcing and it shows in their product. 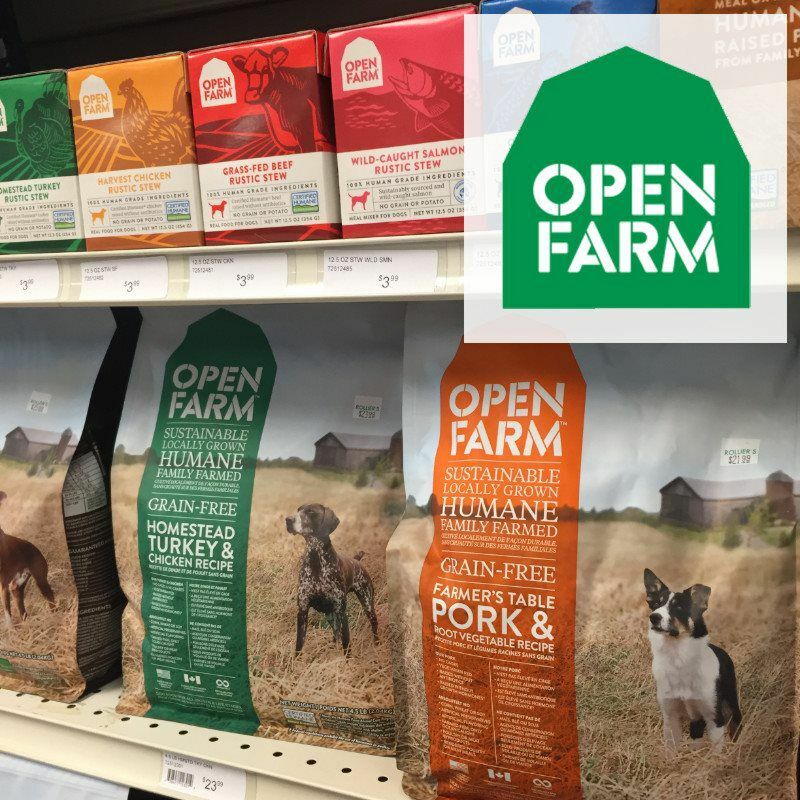 For more information on the Open Farm brand and it's products, please visit their website. What we are stocking: We are currently stocking dry dog food recipes, wet food, freeze-dried treats, and baked dog treats. We also just added 3 dry cat food recipes in February 2019! We have free samples of all dog and cat food recipes, so please ask if you would like to try before you buy!